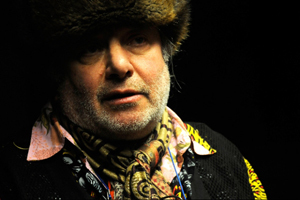 Charlemagne Palestine is a highly influential experimental musician, composer, performer and visual artist. Born in New York in 1945 he studied at New York University, Columbia University, Mannes College of Music and at the California Institute of the Arts. He is a contemporary of Philip Glass, Terry Riley, Phill Niblock, and Steve Reich. Originally trained as a cantor, he was a bell ringer at St. Thomas church in the 1960s and his earlier composition work often focussed on bells. Today Palestine is probably best known for his piano and organ works. As a soloist he has developed a highly individual aesthetic, centered around layered overtones and electronic drones that build and change gradually in gentle harmony. His performances are ritualistic, overtly spiritual in nature and often appear shamanistic. During performances the artist and his piano are surrounded by stuffed animals. He smokes large numbers of Indonesian clove cigarettes and drinks cognac. Palestine has performed internationally and collaborated with artists as diverse as Pan Sonic, Tony Conrad, David Coulter and Michael Gira. To date he has released over twenty solo records and exhibited visual artworks at various venues, including the documenta 8.